Hi Robyn, Thanks so much for hosting me on your blog today. It’s a pleasure to be here as I celebrate the release of my new book Snap Magic – a bewitchingly funny coming-of-age story about secrets, bullies, and pumpkin soup. A few weeks ago I was very fortunate to secure a place in a workshop at The Queensland Writers Centre through The Australia Council for the Arts. The presenter of the workshop – Market Development Skills for Australian Authors – is a publicist for one of Australia’s largest trade publishers. What are the themes/messages in your work? Apparently we should aim for seven themes, and if they are not immediately evident, then we need to ask others who have read our work. Our themes need to be succinct and clear, while the most obvious ones aren’t always the most interesting. Keep brainstorming until you have uncovered all seven. The last two or three will make the most catchy hooks when it comes to writing your book’s pitch. With a short novel of only 12,000 words, I thought this might be an impossible task. But, surprisingly, there were in fact seven themes hidden within my new book Snap Magic. 1. Trust – Twelve-year-old Lily is not sure whether she can trust her best friend Maureen with her secret. And the cute new boy in school… Is he just like all the other boys, or is he OK? 2. Bullying – Lily does her best to avoid the overt bully Rick, but it is the covert bully, Ellen, she should be watching out for. 3. Fears – A tween’s life is filled with anxiety and fears: fear of not fitting in; fear of your secret being found out; fear of the whole school laughing at you. 4. Embarrassing parents – Lily’s mom and dad seem oblivious to her problems. Dad keeps giving away pumpkin soup, and Mom’s new passion for Snap ‘n’ Snack is particularly cringeworthy. 5. Onset of puberty – There are some things Lily would rather pretend aren’t happening – like shopping for a bra with her mom; having her first crush; and that bothersome excess hair on her chin. 6. Humor – Life is full of funny and magical moments. Unfortunately for Lily they all collide in one long sequence of hilarious events. 7. Consequences – For every action there is a reaction. The bullies Rick and Ellen learn this the hard way. And even Lily knows not to trust her old neighbor Mrs Swan’s magic solution – something bad is bound to happen. And there you have it, the seven themes of Snap Magic. It would be interesting to hear whether others are able to find seven themes or messages within their own work too. Leave a message in the comments. Something weird is going on...very weird. Long black hairs keep sprouting from Lily’s chin and her dad is looking more and more like a Yeti. Just what’s behind this fuzz fest? And is Lily really turning into a witch like her neighbor, Mrs Swan?Now the prettiest and meanest girl in class is threatening to tell the whole school, including the cute new boy. Can Lily put her desperate plan into action before the school bully strikes?And will the magical solution Mrs Swan offers work?After all, what’s the worst that could happen?A bewitchingly funny coming-­‐‑of-­‐‑age story about secrets, bullies and pumpkin soup – ideal for 9-­‐‑12 year olds. Edited by Catherine McCredie – former senior editor with Penguin Group Australia, specializing in children’s and young adult books. Something weird is going on...very weird. Long black hairs keep sprouting from Lily’s chin and her dad is looking more and more like a Yeti. Just what’s behind this fuzz fest? And is Lily really turning into a witch like her neighbor, Mrs Swan? Now the prettiest and meanest girl in class is threatening to tell the whole school, including the cute new boy. Can Lily put her desperate plan into action before the school bully strikes? And will the magical solution Mrs Swan offers work? 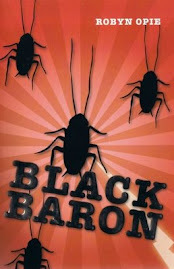 A bewitchingly funny coming-­‐‑of-­‐‑age story about secrets, bullies and pumpkin soup – ideal for 9-­‐‑12 year olds. Angela Sunde is a Gold Coast based author who spent her childhood jumping puddles and climbing trees in her family’s vast orchard. 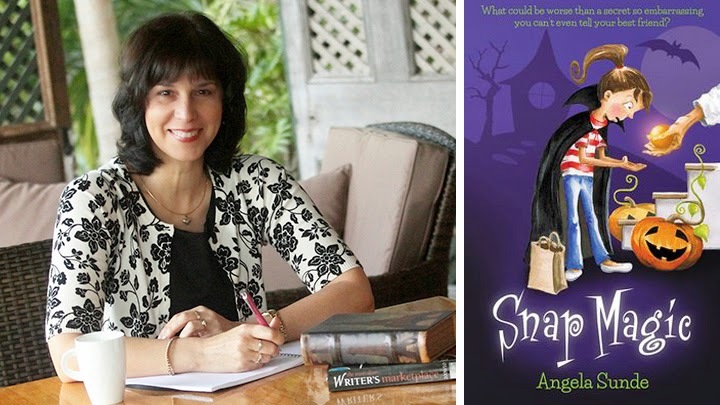 Awarded a May Gibbs Children’s Literature Trust Fellowship in 2013, Angela is the author of Pond Magic (Penguin Group Australia), and illustrator of The Coral Sea Monster – winner of the Write-­‐‑a-­‐‑Book-­‐‑in-­‐‑a-­‐‑Day Award 2011. Formerly an award-­‐‑winning language and literacy teacher, Angela enjoys helping others uncover the magic and humor in daily life through school and library workshops. I'm excited to announce my latest release What Am I? is now available from Amazon. What Am I? is the first book in a new interactive series called First Reader. What Am I? is a book of riddles perfect for the First Reader. Children look at a picture. They tap the screen to read a question. They try to solve the riddle of What Am I? before they go to the next page for the answer. What Am I? makes reading fun. What is the publisher saying about What Am I? Bestselling children's author, Robyn Opie Parnell, has created this delightful interactive Tap and See e-book for kids. Specially designed for the Fire HD Kids Edition Tablet, this First Reader will captivate preschool, kindergarten, and first-grade students with its colorful, fun, and interactive riddles. What Am I? will teach your little loved ones the joys of reading by allowing them to tap and see the answers to simple questions. Robyn Opie Parnell is an acknowledged educational author with over one hundred kids books available in various languages worldwide. The English text to this e-book has been specifically leveled for First Readers by international educational facilities - so we can guarantee there aren't any words or concepts beyond your child's understanding. What Am I? is the first in a series for the Fire HD. Treat your kids to their very own First Reader today! Labels: children's book, children's riddles, e-book, first reader, interactive book, Kids Fire tablet, Robyn Opie Parnell, What Am I?